A Chihuahua! That's what she wanted! 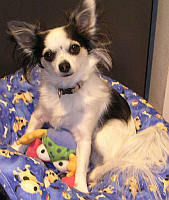 Laura Tonkin had done research on toy breed dogs and loved Chihuahuas for both their history and their tenacity. 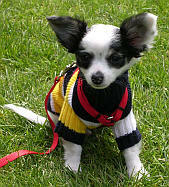 It was 2003 and there weren't many of these dauntless, diminutive dogs to be found in rescue in Washington State. However California had an abundance. Laura corresponded with several Chihuahua rescue groups, but as an out-of-state resident she received few positive responses. Laura next focused her efforts on researching Chihuahua breeders and ultimately decided she couldn't go wrong if she went exclusively to those with AKC registered dogs. Armed with a list of questions, she selected a breeder and went for a visit. She had never seen so many darling little pups. If she hadn't loved Chihuahuas before, she certainly did now! However, instead of finding herself at a reputable breeder, she found herself at what she learned to be a backyard breeder. Deciding she couldn’t leave a pup behind, she started the process of selecting one. Instead of picking an outgoing, playful, friendly pup, her heart was captured by the one who wouldn't stay near her and acted as if she didn't need a thing from anyone. A pup with "issues"... Meka. Today PUP is larger, better organized, and has more wonderful foster families and other volunteers. But PUP's passion and love for these little guys and gals is still the same as it ever was.